I am so pleased to introduce our 2016 Fall Collection of Everyday Arrangements. This has been a fascinating collection to create because fall flowers are so unique in their color and style. They provide so much scope for the imagination. We got a lot of feedback from our customers about how much they enjoyed the bright, garden-style colors in our summer collection so I wanted to be sure to create color combinations that continue to mirror the natural beauty of Northern Virginia. I also wanted to focus a little bit more on this “just gathered” style sweeping the floral design industry. Fall colors are really warm and deeply hued albeit a little more muted than traditional summer flowers. Goldenrods, burgundies and deep pinks have magically started to appear in our Northern Virginia meadows and it’s only a matter of time before the landscape throughout our region becomes a riot of color. My designers and I really love the new trend in wedding flowers towards airy cascading arrangements. You will see that many of the bouquets women are carrying have more space between the flowers so that we can all enjoy each individual bloom. If you look closely at our Fall Collection, you will see the spaces between flowers complimented by loose and textured greenery. You will notice some “spriggy” and “leggy” stems poking out of the designs that characterize some of the natural shapes and movements that we see in a loosely gathered style. There are some really unique flowers in these arrangements that are only available in late summer and early fall. We name some of those in the photos below so that you can continue to educate yourself about flower varieties. Notice the seed pods in two of these arrangements. Fall is natures time to prepare for the hard winter and yet continue to supply the promise of beauty during the returning warmer months. Loudoun County is a very popular wine country destination, boasting some of the best local vineyards in Virginia. This magical arrangement reminds us of an enticing bottle of red or burgundy wine set against the tableau of our local countryside. The style is trendy with a few cascading flowers (Amaranthus) to compliment some of our favorite and unique stems including Red Hypericum Berries, Red Cymbidium, Antique Hydrangea and burgundy Roses. Sunflowers have been so popular this summer at J. Morris Flowers that we just can’t let them go. Everyone loves receiving them as they are so cheery, bright and long lasting. This modern arrangement combines sunflowers with some locally grown stems like Yarrow, Scabiosa, Millet, Seeded Eucalyptus and some beautifully textured orange Garden Roses. 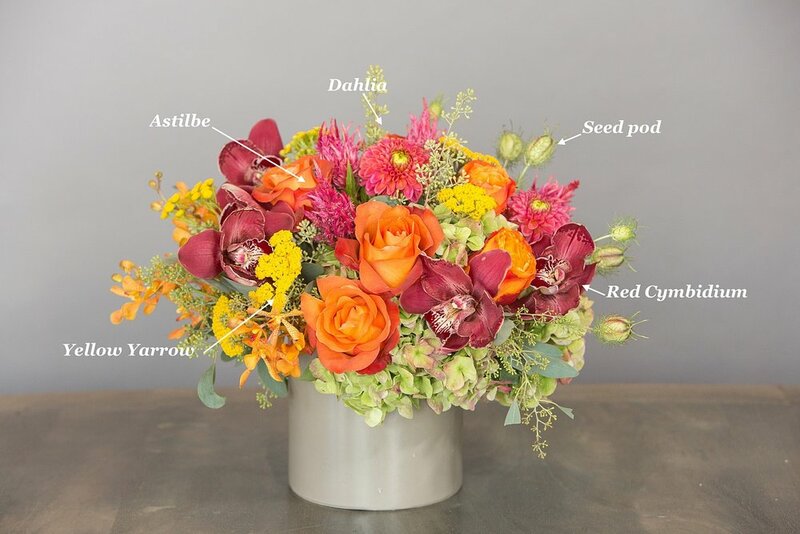 This arrangement captures all of the colors present on that perfect fall day where every tree has presented its' very finest fall color: oranges, wine colored pinks and yellows. We use unique fall-only flowers like Celosia, Orange Mokara Orchids, Dahlia, Seed pod, Yellow Yarrow, Astilbe, and of course, Roses and Antique Hydrangea. This is a full, lush arrangement that will speak volumes about how much you admire and respect the person you are sending it to. We can't stay away from peaches, cream and orange. These colors in combination are such a crowd pleaser. This arrangement is even prettier because of the texture created by Orange Mokara Orchids, textured Seeded Eucalyptus, Seed Pods and green Queen Anne's Lace. And of course, the peach Garden Roses and orange Roses have such a beautiful shape and style. 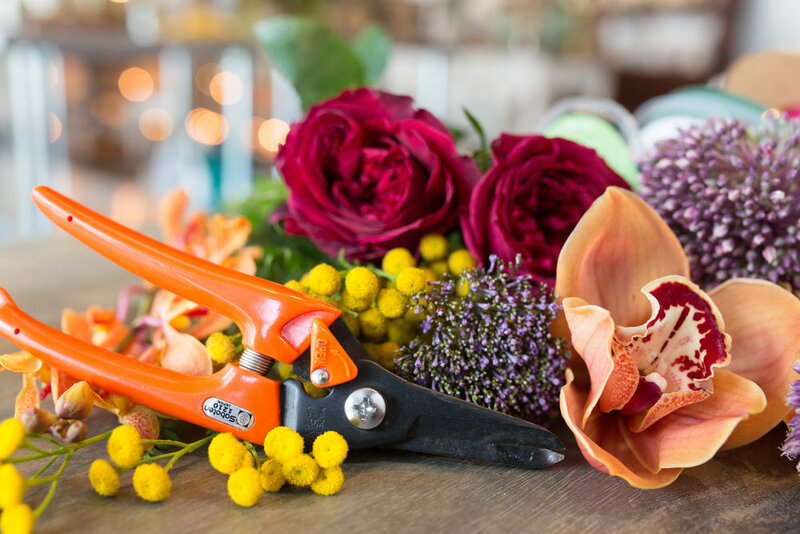 We just love having the opportunity to make a "one-of-a-kind" arrangement for you. We will use seasonal flowers in the colors and variety of your choosing. You can choose our regular arrangement or upgrade to the deluxe or premium arrangement. This "modern dozen" with burnt orange Roses is paired with a succulent in a small votive vase, sold separately. There is something both romantic and reassuring about receiving a dozen roses. Because roses come in so many amazing colors, we are suggesting that you consider sending some in our favorite fall colors -- like the burnt orange roses shown here. Please call our studio anytime to talk about cool and interesting variations that you would like us to create for you. We can expand these arrangements for your special event and parties.